Microsoft has inadvertently leaked an upcoming hybrid email and messaging app via a download webpage marked “Microsoft Confidential”, ZDNet reported Wednesday. 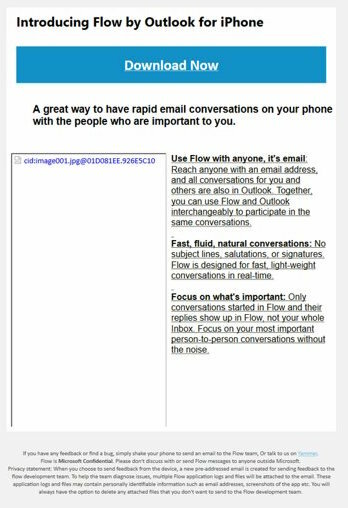 Called ‘Flow by Outlook,’ the lightweight email app should release for the iPhone. It’s being billed as a “great way to have rapid email conversations on your phone with the people who are important to you,” as per leaked changelog. The coming software was discovered by @h0x0d on Twitter. Flow lets you start a conversation with anyone with an email address and continue the exchange later in Outlook. Any email exchanges not started in Flow will be hidden in the app. Unlike Microsoft’s Outlook email client, Flow lacks the usual features such as signatures, salutations and subject lines in favor of an IM-like conversation flow. 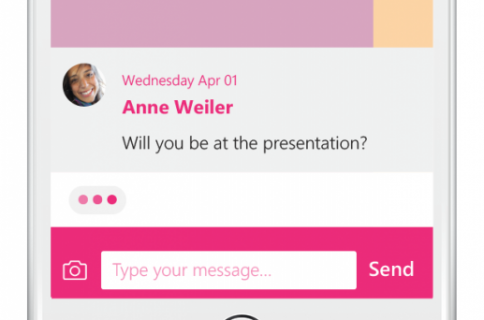 You could say that Flow is Microsoft’s shot at reimagining the email. Release notes provide more details of Flow. Use Flow with anyone, it’s email: Reach anyone with an email address and all conversations for you and others are also in Outlook. Together, you can use Flow and Outlook interchangeably to participate in the same conversations. Fast, fluid, natural conversations: No subject lines, salutations, or signatures. Flow is designed for fast, light-weight conversations in real time. Focus on what’s important: Only conversations started in Flow and their replies show up in Flow, not your whole inbox. Focus on your most important person-to-person conversations without the noise. It’s unclear when the app might hit the App Store. Microsoft’s Outlook client for iOS, available free of charge in the App Store, is lauded for its clean and efficient design, even though it’s basically a rebranded version of the Acompli email client the Windows maker acquired for $200 million at the end of last year.